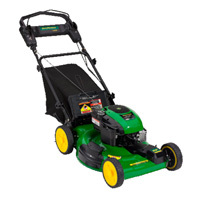 The John Deere JS28 features mow-mentum drive, which gives users greater speed control for better mowing. Its rugged steel deck can handle hilly, uneven terrains, aided by the large, 8-inch rear wheels which roll smoothly on its bearings. We were satisfied with how easily the John Deere JS28 cut through tall, thick grass with no hiccups, and with how the mulching feature worked even on damp grass—no clogging. The only concern we have heard about this mower is that it does not work as well on cold starts and needs to get warmed up. Otherwise, at $349, it’s a good deal and durable mower.